Held at Parisian Laundry, “D’un objet à l’autre” and “Opaque Architectures” is a joint exhibition showcasing recent explorations of renowned Canadian artists Alexandre David and Jaime Angelopoulos, respectively. “D’un objet à l’autre” is a collection of four plywood objects, each spanning the length of a wall, and “Opaque Architectures” is a series of intricate paintings and sculptures which touch upon the theme of depression by highlighting the entrapment of the human spirit inside oppressive structures. Although at first glance I found it difficult to grasp what united the two works, further inspection revealed that both exhibits are a commentary on the subtle, covert nature of the power of common structures, whether physical or psychological. “D’un objet à l’autre” was easy to overlook: David’s ordinary-looking plywood boards nailed to the wall looked so much like part of the gallery space that I bypassed the pieces entirely and went to see the other artwork first. Upon returning, however, I noticed differences in the sculptures that hadn’t captured my sight before: they each seemed to have slight modifications in the angles of the edges and in the cut of the plywood. After about half an hour of carefully navigating the room, I realized that the four slabs of plywood are actually very distinct from one another, despite the similarities that make them a coherent exhibit. The individual boards are full of character in and of themselves: everything from the pattern of micro-swirls formed by the cut of the wood to the way the light hits the surface of the sculptures is unique. The plywood structures turned out to be anything but background noise, although one has to be attentive and patient to grasp this. Angelopoulos’s “Opaque Architectures” is much easier to interpret. Each of the six conté-on-paper works, a technique that uses compressed powdered graphite for drawing, featured a continuous, brightly coloured string trapped by black lines. At first glance, the pieces looked like explorations of form, but in an interview with The Daily, Angelopoulos explained that, “these pieces are part of an attempt to highlight the ubiquitous – [and] therefore invisible – structures oppressing our feelings, impulses, and desires.” One of the most representative pieces is called Parents, which features a continuous pink ray encircled by black lines. The black figures resemble parents stretching their loving arms out and limiting the span of the innocent pink thread, perhaps symbolizing their child, as if in an effort to protect it. 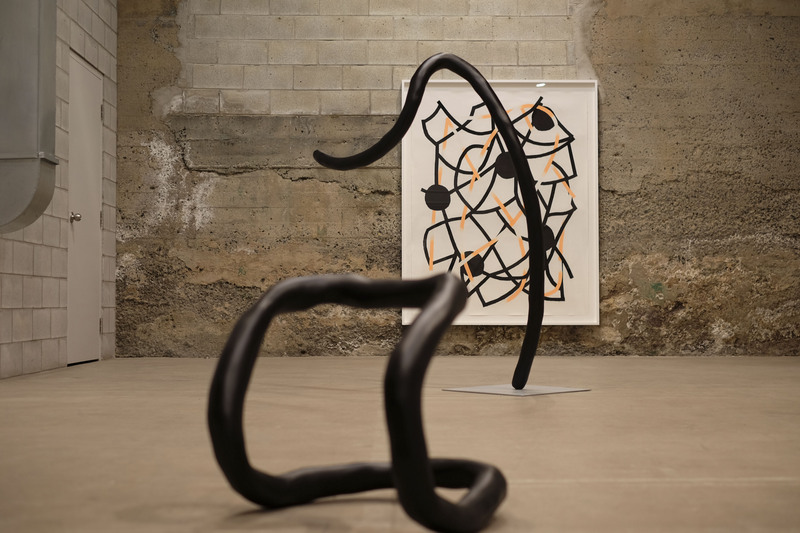 Angelopoulos’s exhibit also features three black steel sculptures, bearing resemblance to the black ball and chain that traps the colour in her two-dimensional works. The sculptures each reference certain oppressive frameworks, such as the way conscience limits our freedom, without directly representing any concrete object. Weight of conscience is visually and symbolically reminiscent of a whip or even a gallows, alluding to the way people’s thoughts torment them while driving their actions, much like a whip makes a horse run but also harms the animal in the process. Another of Angelopoulos’ pieces, You’re Hysterical, portrays a ghostlike figure with its arms up in despair, as if both acquiescing to the negative label imposed upon it by the piece’s title and rebelling against it through an active gesture. The sculpture made me think about mental illness, which can be both a consequence of an overwhelming environment and, perhaps, sometimes allowing the sufferer to dissociate from and push against the structures that oppress them. Both artists’ pieces in the exhibit achieved their goal of exposing invisible structures by highlighting their idiosyncrasies and oppressive nature while prompting viewers to reflect on them. If you decide to go (and you should), go twice: you will notice something different each time. “D’un objet à l’autre” and “Opaque Architectures” run until April 23 at Parisian Laundry gallery.